According to an analysis of ODJFS’ job information, Economic Research Analyst George Zeller of Cleveland, seen by some as Ohio’s class-A digester and interpreter of such detailed information, said new October 2017 data extends Ohio’s “terrible sub-par job growth streak to 60 consecutive months,” including all months between December 2012 and November 2017. For fans who focus on the unemployment rate, Ohio’s estimated unemployment rate estimate was 17 percent higher than that of the national estimated unemployment rate of 4.1 percent. This marked the 15th consecutive month Kasich has missed being above average on this metric. What the new, more accurate figures indicate, Zeller says in simple language, is “the speed at which Ohio is gaining jobs during an economic recovery continues to be too slow.” Another angle is year-over-year job growth, between November 2016 and November 2017, which clocks in at under one percent. Compare 0.80 percent with the same USA measure of 1.44 percent, and it doesn’t take a math whiz to see the poor performance record by Kasich and JobsOhio, his pet and secret creation that avoids public disclosures laws. Ticking off each year, Zeller provides job figures that out of context sound great, like when Gov. Kasich says the state is up hundreds of thousands of job, which is true, but in context is not very good. Zeller provides that help with these figures: 2013, Ohio’s job growth was 76,000 jobs; 2014, Ohio gained 96,000 jobs. Improving growth performance is growth but it’s below the national average level of employment growth within the state, Zeller notes. He then shows us the declines over the past two years: 2015, Ohio gained a modest 60,700 jobs; 2016 Ohio gained only 49,700 jobs, “the slowest annual job growth that Ohio has generated since 1999,” he says. On a lesser known and discussed topic, but one that paints a bright or dreary picture of Ohio’s workforce capabilities, that businesses looking for suitable sites, like Amazon is doing now to find a location for its second headquarters, the 2000-2011 labor market recession Zeller isolates is a “critical major problem” that he says is is still large. When states compete to woo giants like Amazon to build inside their borders, size, strength and sustainability of the workforce cannot be underestimated. States offering worker forces that meet the short- and long-term needs of employers will beat out states like Ohio where those indices are weak or slow to mature. Based on these metrics, Gov. Kasich has more catching-up to than days left in his second term allow him. But how will Ohio respond to this urgent need when its population growth is barely positive, where the costs of education are above national averages, and where state officials like Gov. 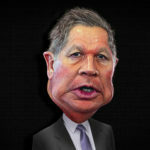 Kasich and a like-minded legislature devoted to austerity versus expanding revenue? Kasich used to call his work in Ohio miraculous, but the reality of today’s miracle is that the state isn’t the worse off for wear from Kasich’s strongarm tactics to sequester local government funds in Ohio’s emergency or “rainy day” fund. Ohio made its name over time in manufacturing, so when manufacturing jobs growth, that’s a good sign, despite it beieng as slow as it has been. Zeller again instructs his readers on the importance of government jobs, a class of jobs Gov. Kasich is proud to say he has fewer of today than before.